Peter Downsbrough, And That, lp, Sub Rosa, 2009 … … … 12 EUR An audio work from Peter Downsbrough with music by Xavier Garcia Bardon and I.
Benjamin Franklin, Live at OCCii march 9th 2008, cdr, Stenze Quo, 2009 … … … 5 EUR New cdr with recent live from Amsterdam with huge cover by ze best called Fyoelk. 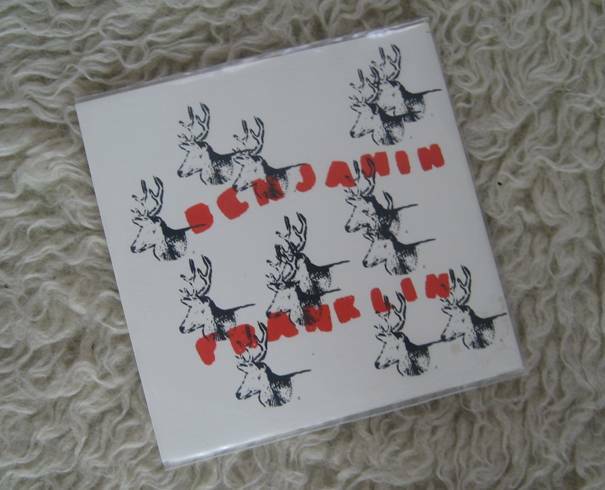 Benjamin Franklin, cassette blanche, c-40, Disques de l’Oubli, 2009 … … … 5 EUR This is 38 minutes old recordings from 98, a tape on this new label ran by TG from Paris, France. With a beautiful painting cover by Jeanne Boyer from Paris, Love. Also available at Bimbo Tower in Paris or via les Editions de l’Oubli. Buffle, Camille-Lili, Esther & Roxanne, ?, cdr, Young Girls Records, 2009 … … … 5 EUR A Sunday afternoon, sunny day in Brussels with unchained kids (live at compilothèque, summer 2008). 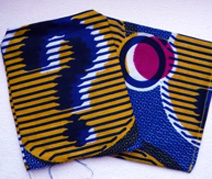 New cdr Made in Liège wrapped in beautiful African boubou. Insert by Bongo Man. Also available via Young Girls Records. 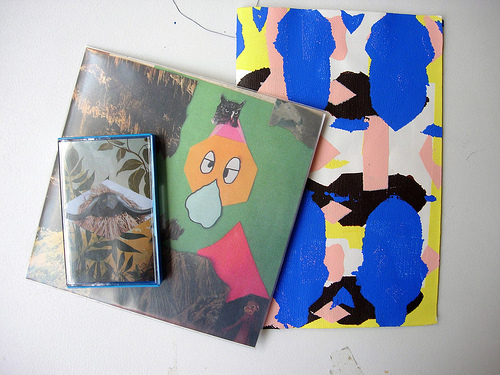 Buffle, Dead City Holograms, 7″, 2008 … … … 5 EUR First Buffle vinyl, with tracks from 2007. Also available via mail-orders Release The Bats (Sweden), Ikuisuus (Finland), Ozonokids (Spain), A-Musik (Germany), Time-Lag (USA, soon) and various shops like Pitkä Mies in Helsinki. For sale via discogs. 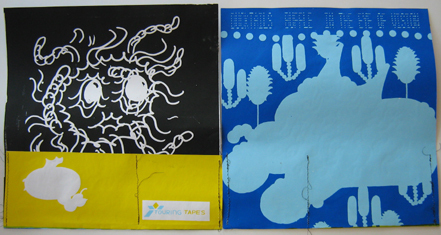 Buffle, Cavernicole, c-11, Relax Produzioni, 2008 … … … 4 EUR Little blues tape on this italian label. Also available via mail-orders Release The Bats (Sweden), Ikuisuus (Finland), Ozonokids (Spain), A-Musik (Germany), Time-Lag (USA). Maybe available via discogs. Benjamin Franklin, La pente/Loupiotes, 7″, Lexi, 2008 … … … 5 EUR New 7inch released by Diqsues Lexi from Saint-Josse, silkscreen artwork by Serena Emiliani. 500 copies pressed, i take some copies at concerts. Also available via mail-orders Twisted Knister (Germany), DNT Records (USA), Tomentosa (USA), Ozonokids (Spain), Twinkelding (B, soon) and various shops in Brussels (V&G, Arlequin [Rue du Chêne], Quarantaine, La Licorne [Uccle], Mapp [Depage], United Musik [Fontainas], Pêle Mêle [Lemonier]), Paris (Bimbo Tower), Helsinki (Pitkä Mies), Bologna (Modo), Berlin (Staalplaat). It’s also possible via discogs. R.O.T., Schansspelen/Teleurstellingen, cd-r 3″, Imvated, 2003 … … … ?? EUR few copies of this R.O.T. little cd-r maked by Lieven and Floris from Imvated. Two long tracks played in 2001 at the Bram’s atelier in the former Moving Art Studio building à la Rue des Tanneurs. Maybe also available via discogs. 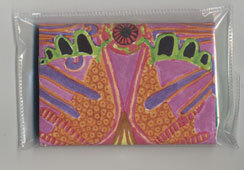 V/A, Kicks, cd-r, no label, 2003 … … … 5 EUR Two copies of this compilation from the festival organized by The Vibracathedral Orchestra in Leeds on january 16-17, 2003. Tracks from Benjamin Franklin, Toss, Köhn, Sunroof!, Vibracathedral Orchestra and Birchville Cat Motel. You can also check the discogs shop. Juste: il faut compter aussi les coûts d’envoi. Sinon on peut se croiser bien sûr.